As Halloween parties went off across town, L.A.’s liveliest celebration of the dead once again took over Hollywood Forever Cemetery. 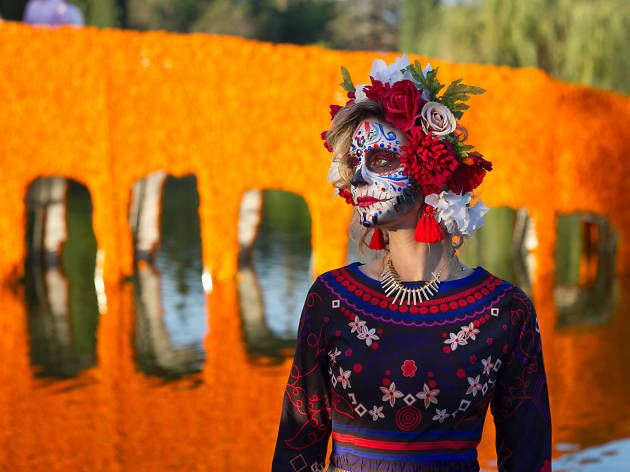 The annual L.A. Day of the Dead festival brought out thousands of elaborately costumed attendees to the cemetery grounds, which were transformed into a marigold-covered, music-and-dance–filled Day of the Dead celebration. 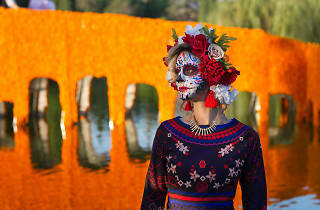 Sugar skulls and calacas covered the colorful altars and ofrendas to the deceased, while Aztec dancers, local bands, face painters and artisans all offered their own take on the Mexican holiday. For its 19th annual edition, the festival theme was Coatlicue “Mother of Gods,” which honored the Aztec goddess and mother of the moon, sun and stars. Stone statues and snake motifs abounded throughout the cemetery, as did altars dedicated to female empowerment and equal rights. The event’s politics were less fiery than last year, but also, thankfully, the somewhat over-the-top marketing presence was stepped back compared to the previous edition (we’re willing to forgive the most overt instance, a Spotify sponsorship of a marigold bridge dedicated to the late Jenni Rivera, for how stunningly beautiful it was). It was also the first Day of the Dead since the release of Coco, and altar decorators weren’t shy to slip some of that film’s iconography into their creations. Check out our photos below of beautiful altars, elaborately adorned outfits and one adorable alebrije to see why L.A. Day of the Dead continues to be one of our favorite events.